“Sinking of the Lusitania” is an informative lecture at the Bridgewater Public Library presented by Historian and Professor Dr. Gary Hylander on Tuesday, May 9th at 6:30 pm. May marks the anniversary of the sinking of the Lusitania, one of the most luxurious and impressive passenger liners ever built. 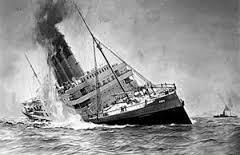 Although Britain was at war with Germany, Captain Charles Turner bragged, “A torpedo can’t get the Lusitania. She runs too fast.” He was wrong. Join us as we discuss how the disaster of the Lusitania sinking affected American public opinion and President Wilson’s view as to whether or not America should enter the Great War of 1914-1918.